Republican lawmaker Rob Bishop is trying to prove that craziness in the Republican Party isn’t just reserved for those in leadership positions, and he recently said in an interview that passage of the Green New Deal was “tantamount to genocide.” He then clarified that he knows this because he’s “an ethnic.” The guy is whiter than mayonnaise, and he’s dead wrong about what the Green New Deal would actually do. Ring of Fire’s Farron Cousins discusses this. You know, a lot of people think that, you know, for the most part Republican politicians there. Okay, we’ve got some crazy ones at the top. You know, we’ve got Mitch McConnell and Lindsey Graham and of course Donald Trump. But you know, some of them, some of the other folks there may be not as bad. Well, I’ve got news for you, Ladies and gentlemen, they’re all really just awful, horrible people. 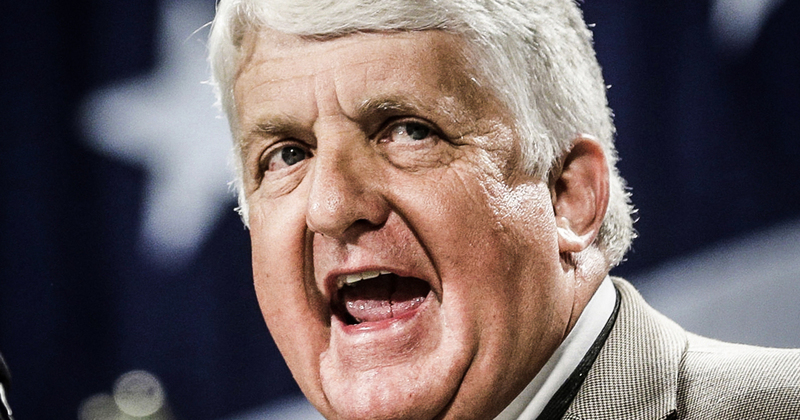 This week we had Republican Representative Rob Bishop from Utah and Rob Bishop while talking about the green new deal at a press conference referred to it as tantamount to genocide in the mind of a guy like Rob Bishop protecting the environment is essentially genocide for the American people. Here is his exact quote. He said, the ideas behind the green new deal are tantamount to genocide. Uh, that might be an overstatement, but not by a whole lot. Genocide protecting the planet, reducing pollution, getting corporate toxins out of our air and water is somehow going to result in the deaths of millions of Americans, which is what genocide would, would be. I don’t know if this guy even knows what that word means, but, um, no, I mean I really don’t know how else to say that. Like you’re wrong. You’re an idiot. I think you need psychiatric help because why on earth would you think that making the planet better, making water cleaner, an air cleaner, reducing the severity of storms by reversing course on climate change, getting us off fossil fuels, getting coal miners out of the minds and end of the day light building windmills and solar panels. How was that genocide? And in fact, I’m not the only one who had this question. Reporters from Axios who were present at the press conference asked him, Mike, hold up dude, what the hell are you talking about? And here’s his answer. I’m an ethnic, I’m a westerner. So they asked him what he means by the green new deal as genocide. And His answer was, I’m an ethnic, I’m a westerner, I’m an ethnic. All right? First of all, if you’ve never seen Rob Bishop, this guy is wider than Manet’s. Okay? You’re not an ethnic anything. And I’m not trying to pick on you for race, but what the hell does, I’m an ethnic mean. I’m a Westerner. You’re a citizen of the United States. You were born here in the United States. Maybe you have some ancestry somewhere down the line. Maybe there’s somewhere in in your family tree that was part of a race or religion that was attacked via genocide, but you personally were not, so none of that even really matters does it? Your trying to lie to the American public about what the green new deal is about what it does and about what the effects are going to be on the American people. The green new deal would save lives, not destroy them. It is essentially a jobs program that would put more people to re work rather than killing jobs. There is no genocide here, Viet economically or socially. Nobody is going to get hurt from the green new deal except maybe a few fossil fuel companies that love to run a line. The pockets of people like Ron Bishop or Rob Bishop, excuse me, because they know that he’s going to go out there and say the craziest things imaginable to protect the profits of the companies who keep them in office. And that’s why we get these insane statements. Like the green new deal is tantamount to genocide.